Girl: Nice ... soft and yummy. Hmm another one ! ... try one more! Boy: Oh ! This is so nice. How many cookies did you bake? 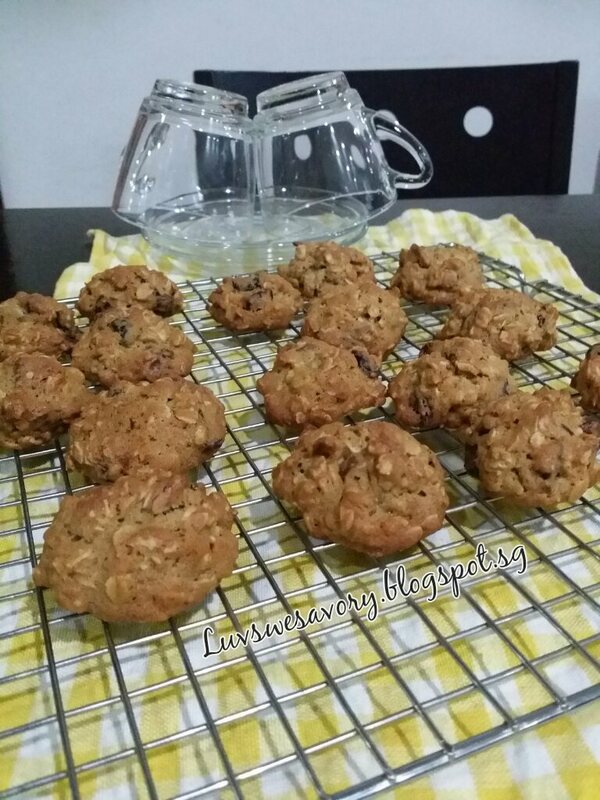 They couldn't stop munching these warm yummy cookies while still cooling on the rack. 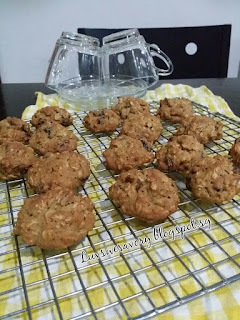 The addition of rolled oats gives slightly crisp on the outside yet soft in the center texture. Love the woody cinnamon fragrance too. 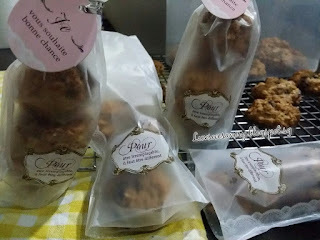 I must say that these cookies are very addictive. Easy to bake as festive giveaway gifts for busy mom like me. I reduced the sugar amount. Allow butter to stand at room temperature. Combine ingredients (B) in a medium bowl and set a set. In large mixing bowl, beat butter and sugars with electric mixer on medium-high until light and fluffy. (approx. 3 minutes). Add egg and vanilla extract beat on high for 1 minute. Turn mixer to low speed and add flour mixture, mix until just combined. Preheat oven to 176°C and position the rack in the middle. *Note : The temperature of the oven may vary, do adjust accordingly. Using a tablespoon measurement, scoop a round heap of dough on the prepared baking sheet and gently press to flatten top slightly if you wish to. Space the dough well apart about 1.5 inches between each cookie. Bake for 12 mins or until edges are lightly browned but center is still soft and unset. Cool slightly on the baking sheet (about 5 minutes) before transferring them onto a wire rack to cool completely. Store them in airtight container. 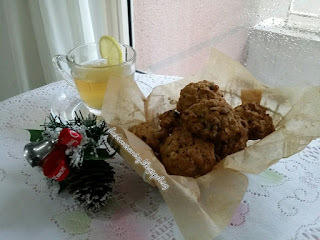 On the request of my girl, baked again another batch with mixture of raisins and cranberries. 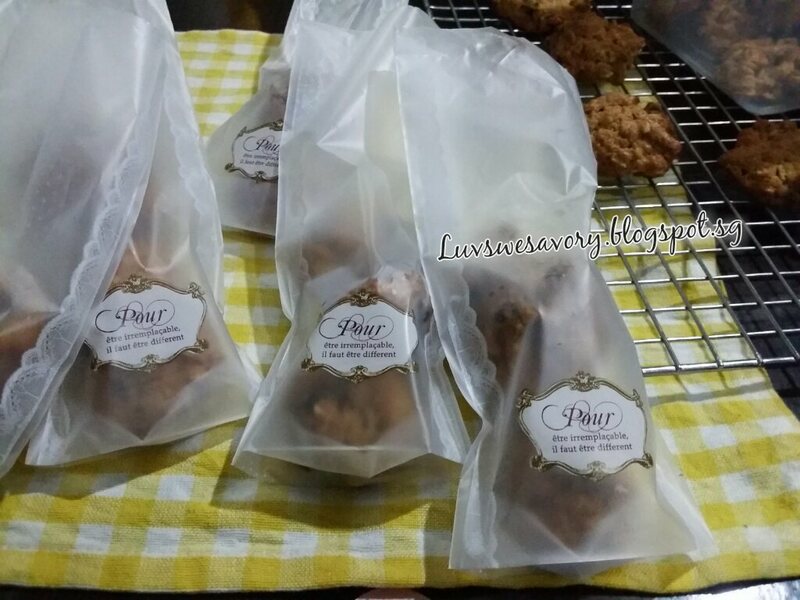 Packed some for giveaways as the first batch of cookies were finished by the "cookie monsters" in just a day ! ... hee ... hee! Happy baking ! Enjoy ! 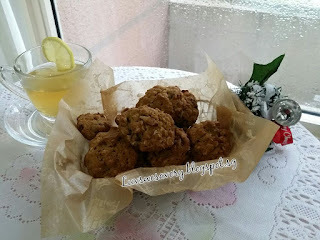 I will be munching non stop too if I bake these cookies. Half in tummy and half in containers! Lol! Hi Karen, my favorite cookies always have oatmeal in them. I can see why your kids loved these so much.